Should economists have seen the productivity crisis coming? The UK’s post-financial crisis stagnation in productivity finally hit the headlines this month. Before the financial crisis, productivity grew at a steady 2.2% a year, but since 2009 growth has averaged only 0.3%. The Office of Budgetary Responsibility, in common with other economic forecasters, have confidently predicted the return of 2.2% growth every year since 2010, and every year they have been disappointed. This year, the OBR has finally faced up to reality – in its 2017 Forecast Evaluation Report, it highlights the failure of productivity growth to recover. The political consequences are severe – lower forecast growth means that there is less scope to relax austerity in public spending, and there is little hope that the current unprecedented stagnation in wage growth will recover. I think this is enormously unconvincing. Economists are unanimous about the importance of productivity growth as the key driver of the economy, and agree that technological progress (sufficiently widely defined) is the key source of that productivity growth. Why, then, should macro forecasters not feel the need to think about technical progress? As a general point, I think that (many) economists should pay much more attention both to the institutions in which innovation takes place (for example, see my critique of Robert Gordon’s book) and to the particular features of the defining technologies of the moment (for example, the post-2004 slowdown in the rate of growth of computer power). The specific argument here is that the steadiness of the productivity growth trend before the crisis justified the assumption that this trend would be resumed. But this assumption only holds if there was no reason to think anything fundamental in the economy had changed. It should have been clear, though, that the UK economy had indeed changed in the years running up to 2007, and that these changes were in a direction that should have at least raised questions about the sustainability of the pre-crisis productivity trend. These changes in the economy – summed up as a move to greater financialisation – were what caused the crisis in the first place. But, together with broader ideological shifts connected with the turn to market liberalism, they also undermined the capacity of the economy to innovate. Our current productivity stagnation undoubtedly has more than one cause. Simon Wren-Lewis, in his discussion of the problem, has focused on the effect of bad macroeconomic policy. It seems entirely plausible that bad policy has made the short-term hit to growth worse than it needed to be. But a decade on from the crisis, we’re not looking at a short-term hit anymore – stagnation is the new normal. My 2016 paper “Innovation, research and the UK’s productivity crisis” discusses in detail the deeper causes of the problem. One important aspect is the declining research and development intensity of the UK economy. The R&D intensity of the UK economy fell from more than 2% in the early 80’s to a low point of 1.55% in 2004. This was at a time when other countries – particularly the fast-developing countries of the far-east – were significantly increasing their R&D intensities. The decline was particularly striking in business R&D and the applied research carried out in government laboratories; for details of the decline see my own 2013 paper “The UK’s innovation deficit and how to repair it”. But stepping back from applied research by the state coincided with a new emphasis on “shareholder value” in public companies, which led industry to cut back on long-term investments with uncertain returns, such as R&D. Much of this outcome was predictable in economic theory, which predicts that private sector actors will underinvest in R&D due to their inability to capture all of its benefits. Economists’ understanding of innovation and technological change is not yet good enough to quantify the effects of these developments. But, given that, as a result of policy changes, the UK had dismantled a good part of its infrastructure for innovation, a permanent decrease in its potential for productivity growth should not have been entirely unexpected. The Office of Budgetary Responsibility’s Chart of Despond. From the press conference slides for the October 2017 Forecast Evaluation Report. Author Richard JonesPosted on October 22, 2017 Categories General, Science policy1 Comment on Should economists have seen the productivity crisis coming? What should a modern industrial strategy for the UK look like? This week the Industrial Strategy Commission, of which I’m a member, published its interim report – Laying the Foundations – which sets out some positive principles which we suggest could form the basis for an Industrial Strategy. This follows the government’s own Green Paper, Building our Industrial Strategy, to which we made a formal response here. I made some personal comments of my own here. The government is expected to publish its formal policy on Industrial Strategy, in a White Paper, in the autumn. There’s a summary of our report on the website, and my colleague and co-author Diane Coyle has blogged about it here. Here’s my own perspective on the most important points. The starting point must be a recognition of the multiple and persistent weaknesses of the UK economy, which go back to the financial crisis and beyond. We still hear politicians and commentators asserting that the economy is fundamentally strong, in defiance both of the statistical evidence and the obvious political consequences we’ve seen unfolding over the last year or two. Now we need to face reality. The UK’s economy has three key weaknesses. Its productivity performance is poor; there’s a big gap between the UK and competitor economies, and since the financial crisis productivity growth has been stagnant. This poor productivity performance translates directly into stagnant wage growth and a persistent government fiscal deficit. There are very large disparities in economic performance across the country; the core cities outside London, rather than being drivers of economic growth, are (with the exception of Bristol and Aberdeen) below the UK average in GVA per head. De-industrialised regions and rural and coastal peripheries are doing even worse. The UK can’t achieve its potential if large parts of it are held back from fully contributing to economic growth. The international trading position of the country is weak, with large and persistent deficits in the current account. BREXIT threatens big changes to our trading relationships, so this is not a good place to be starting from. The obvious corollary of the UK’s economic weakness has to be a realisation that whatever we’ve been doing up to now, it hasn’t been working. This isn’t to say that the UK hasn’t had policies for industry and economic growth – it has, and some of them have been good ones. But a collection of policies doesn’t amount to a strategy, and the results tell us that even the good policies haven’t been executed at a scale that makes a material difference to the problems we’ve faced. A strategy needs to start with a vision of where the country is going, around which a sense of national purpose can be build. How is the country going to make a living, how is it going to meet the challenges it’s facing? This needs to be clearly articulated and a consensus built that will last longer than one political cycle. It needs to be founded on a realistic understanding of the UK’s place in the world, and of the wider technological changes that are unfolding globally. We suggest six big problems that an industrial strategy should be built around. Decarbonisation of the energy economy whilst maintaining affordability and security of the energy supply. Ensuring adequate investment in infrastructure to meet current and future needs and priorities. Developing a sustainable health and social care system. Unlocking long-term investment – and creating a stable environment for long-term investments. Supporting established and emerging high-value industries – and building export capacity in a changing trading environment. Enabling growth in parts of the UK outside London and the South East in order to increase the UK’s overall productivity and growth. our skills policy has been an extreme example of a more general problem of policy churn, with a continuous stream of new initiatives being introduced before existing policies have had a chance to prove their worth or otherwise. The Industrial Strategy Commission is a joint initiative of the Sheffield Political Economy Research Institute and the University of Manchester’s Policy@Manchester unit. My colleagues on the commission are the economist Diane Coyle, the political scientist Craig Berry, policy expert Andy Westwood, and we’re chaired by Dame Kate Barker, a very distinguished business economist and former member of the Bank of England’s powerful Monetary Policy Committee. We benefit from very able research support from Tom Hunt and Marianne Sensier. As someone interested in the history of innovation, I take great pleasure in seeing the many tangible reminders of the industrial revolution that are to be found where I live and work, in North Derbyshire and Sheffield. I get the impression that academics are sometimes a little snooty about local history, seeing it as the domain of amateurs and enthusiasts. If so, this would be a pity, because a deeper understanding of the histories of particular places could be helpful in providing some tests of, and illustrations for, the grand theories that are the currency of academics. I’ve recently read the late David Hey’s excellent “History of Sheffield”, and this prompted these reflections on what we can learn about the history of innovation from the example of this city, which became so famous for its steel industries. What can we learn from the rise (and fall) of steel in Sheffield? “Ther was no man, for peril, dorste hym touche. The Reeves Tale, Canterbury Tales, Chaucer. When the Londoner Geoffrey Chaucer wrote these words, in the late 14th century, the reputation of Sheffield as a place that knives came from (Thwitel = whittle: a knife) was already established. As early as 1379, 25% of the population of Sheffield were listed as metal-workers. This was a degree of focus that was early, and well developed, but not completely exceptional – the development of medieval urban economies in response to widening patterns of trade was already leading to specialisation based on the particular advantages location or natural resources gave them. Towns like Halifax and Salisbury (and many others) were developing clusters in textiles, while other towns found narrower niches, like Burton-on-Trent’s twin trades of religious statuary and beer. Burton’s seemingly odd combination arose from the local deposits of gypsum ; what was behind Sheffield’s choice of blades? What has science policy ever done for Barnsley? Cambridge’s Centre for Science and Policy, where I am currently a visiting fellow, held a roundtable discussion yesterday on the challenges for science policy posed by today’s politics post-Brexit, post-Trump, introduced by Harvard’s Sheila Jasanoff and myself. This is an expanded and revised version of my opening remarks. I’m currently commuting between Sheffield and Cambridge, so the contrast between the two cities is particularly obvious to me at the moment. Cambridgeshire is one of the few regions of the UK that is richer than the average, with a GVA per head of £27,203 (the skewness of the UK’s regional income distribution, arising from London’s extraordinary dominance, leads to the statistical oddness that most of the country is poorer than the average). Sheffield, on the other hand, is one of the less prosperous provincial cities, with a GVA per head of £19,958. But Sheffield doesn’t do so badly compared with some of the smaller towns and cities in its hinterland – Barnsley, Rotherham and Doncaster, whose GVA per head, at £15,707, isn’t much more than half of Cambridge’s prosperity. This disparity in wealth is reflected in the politics. In the EU Referendum, Cambridge voted overwhelmingly – 74% – for Remain, while Barnsley, Rotherham and Doncaster voted almost as overwhelmingly – 68 or 69% – to Leave. The same story could be told of many other places in the country – Dudley, in the West Midlands, Teeside, in the Northeast, Blackburn, in the Northwest. This is not just a northern phenomenon, as shown by the example of Medway, in the Southeast. These are all places with poorly performing local economies, which have failed to recover from 1980’s deindustrialisation. They have poor levels of educational attainment, low participation in higher education, poor social mobility, low investment, low rates of business start-ups and growth – and they all voted overwhelmingly to leave the EU. Somehow, all those earnest and passionate statements by eminent scientists and academics about the importance for science of remaining in the EU cut no ice in Barnsley. And why should they? We heard about the importance of EU funding for science, of the need to attract the best international scientists, of how proud we should be of the excellence of UK science. If Leave voters in Barnsley thought about science at all, they might be forgiven for thinking that science was to be regarded as an ornament to a prosperous society, when that prosperity was something from which they themselves were excluded. Of course, there is another argument for science, which stresses its role in promoting economic growth. That is exemplified, of course, here in Cambridge, where it is easy to make the case that the city’s current obvious prosperity is strongly connected with its vibrant science-based economy. This is underpinned by substantial public sector research spending, which is then more than matched by a high level of private sector innovation and R&D, both from large firms and fast growing start-ups supported by a vibrant venture capital sector. The figures for regional R&D bear this out. East Anglia has a total R&D expenditure of €1,388 per capita – it’s a highly R&D intensive economy. This is underpinned by the €472 per capita that’s spent in universities, government and non-profit laboratories, but is dominated by the €914 per capita spent in the private sector, directly creating wealth and economic growth. This is what a science-based knowledge economy looks like. South Yorkshire looks very different. The total level of R&D is less than a fifth of the figure for East Anglia, at €244 per capita; and this is dominated by HE, which carries out R&D worth €156. Business R&D is less than 10% of the figure for East Anglia, at €80 per capita. This is an economy in which R&D plays very little role outside the university sector. An interesting third contrast is Inner London, which is almost as R&D intensive overall as East Anglia, with a total R&D expenditure of €1,130 per capita. But here the figure is dominated not by the private sector, which does €323 per capita R&D, but by higher education and government, at €815 per capita. A visitor to London from Barnsley, getting off the train at St Pancras and marvelling at the architecture of the new Crick Institute, might well wonder whether this was indeed science as an ornament to a prosperous society. To be fair, governments have begun to recognise these issues of regional disparities. I’d date the beginning of this line of thinking back to the immediate period after the financial crisis, when Peter Mandelson returned from Brussels to take charge of the new super-ministry of Business, Innovation and Skills. Newly enthused about the importance of industrial strategy, summarised in the 2009 document “New Industry, New Jobs”, he launched the notion that the economy needed to be “rebalanced”, both sectorally and regionally. We’ve heard a lot about “rebalancing” since. At the aggregate level there has not been much success, but, to be fair, the remarkable resurgence of the automobile industry perhaps does owe something to the measures introduced by Mandelson’s BIS and InnovateUK, and continued by the Coalition, to support innovation, skills and supply chain development in this sector. One area in which there was a definite discontinuity in policy on the arrival of the Coalition government in 2010 was the abrupt abolition of the Regional Development Agencies. They were replaced by “Local Enterprise Partnerships”, rather loosely structured confederations of local government representatives and private sector actors (including universities), with private sector chairs. One good point about LEPs was that they tended to be centred on City Regions, which make more sense as economic entities than the larger regions of the RDAs, though this did introduce some political complexity. Their bad points were that they had very few resources at their disposal, they had little analytical capacity, and their lack of political legitimacy made it difficult for them to set any real priorities. What was meant by “place” here was, like much else in this strategy, conceptually muddled. On the one hand, it seemed to be celebrating the clustering effect, by which so much science was concentrated in places like Cambridge and London. On the other hand, it seemed to be calling for science investment to be more explicitly linked with regional economic development. It has been this second sense that has subsequently developed by the new, all Conservative government. The Science Minister, Jo Johnson, announced in a speech in Sheffield, the notion of “One Nation Science” – the idea that science should be the route for redressing the big differences in productivity between regions in the UK. The key instrument for this “place agenda” was to be the “Science and Innovation Audits” – assessments of the areas of strength in science and innovation in the regions, and suggestions for where opportunities might exist to use and build on these to drive economic growth. I have been closely involved in the preparation of the Science and Innovation Audit for Sheffield City Region and Lancashire, which was recently published by the government. I don’t want to go into detail about the Science and Innovation Audit process or its outcomes here – instead I want to pose the general question about what science policy can do for “left behind” regions like Barnsley or Blackburn. It seems obvious to me that “trophy science” – science as an ornament for a prosperous society – will be no help. And while the model of Cambridge – a dynamic, science based economy, with private sector innovation, venture capital, and generous public funding for research attracting global talent – would be wonderful to emulate, that’s not going to happen. It arose in Cambridge from the convergence of many factors over many years, and there are not many places in the world where one can realistically expect this to happen again. Instead, the focus needs to be much more on the translational research facilities that will attract inward investment from companies operating at the technology frontier, on mechanisms to diffuse the use of new technology quickly into existing businesses, on technical skills at all levels, not just the highest. The government must have a role, not just in supporting those research facilities and skills initiatives, but also in driving the demand for innovation, as the customer for the new technologies that will be needed to meet its strategic goals (for a concrete proposal of how this might work, see Stian Westlake’s blogpost “If not a DARPA, then what? The Advanced Systems Agency” ). The question “What have you lot ever done for Barnsley” is one that I was directly asked, by Sir Steve Houghton, leader of Barnsley Council, just over a year ago, at the signing ceremony for the Sheffield City Region Devo Deal. I thought it was a good question, and I went to see him later with a considered answer. We have, in the Advanced Manufacturing Research Centre, a great translational engineering research facility that demonstrably attracts investment to the region and boosts the productivity of local firms. We have more than 400 apprentices in our training centre, most sponsored by local firms, not only getting a first class training in practical engineering (some delivered in collaboration with Barnsley College), but also with the prospect of a tailored path to higher education and beyond. We do schools outreach and public engagement, we work with Barnsley Hospital to develop new medical technologies that directly benefit his constituents. I’m sure he still thinks we can do more, but he shouldn’t think we don’t care any more. The referendum was an object lesson in how little the strongly held views of scientists (and other members of the elite) influenced the voters in many parts of the country. For them, the interventions in the referendum campaign by leading scientists had about as much traction as the journal Nature’s endorsement of Hilary Clinton did across the Atlantic. I don’t think science policy has done anything like enough to answer the question, what have you lot done for Barnsley … or Merthyr Tydfil, or Dudley, or Medway, or any of the many other parts of the country that don’t share the prosperity of Cambridge, or Oxford, or London. That needs to change now. Author Richard JonesPosted on November 18, 2016 November 18, 2016 Categories General, Science policy1 Comment on What has science policy ever done for Barnsley? “The Rose of Temperaments” was a colour diagram devised by Goethe in the late 18th century, which matched colours with associated psychological and human characteristics. The artist Paul Evans has chosen this as a title for a project which forms part of Sheffield University’s Festival of the Mind; for it six poets have each written a sonnet associated with a colour. Poems by Angelina D’Roza and A.B. Jackson have already appeared on the project’s website; the other four will be published there over the next few weeks, including the piece by Helen Mort, from which my opening excerpt is taken. Goethe’s theory of colour was a comprehensive cataloguing of the affective qualities of colours as humans perceive them, conceived in part as a reaction to the reductionism of Newton’s optics, much in the same spirit as Keats’s despair at the tendency of Newtonian philosophy to “unweave the rainbow”. But if Newton’s aim was to remove the human dimension from the analysis of colour, he didn’t entirely succeed. In his book “Opticks”, he retains one important distinction, and leaves one unsolved mystery. He describes his famous experiments with a prism, which show that white light can be split into its component colours. But he checks himself to emphasise that when he talks about a ray of red light, he doesn’t mean that the ray itself is red; it has the property of producing the sensation of red when perceived by the eye. The mystery is this – when we talk about “all the colours of the rainbow”, a moment’s thought tells us that a rainbow doesn’t actually contain all the colours there are. Newton recognised that the colour we now call magenta doesn’t appear in the rainbow – but it can be obtained by mixing two different colours of the rainbow, blue and red. All this is made clear in the context of our modern physical theory of colour, which was developed in the 19th century, first by Thomas Young, and then in detail by James Clerk Maxwell. They showed, as most people know, that one can make any colour by mixing the three primary colours – red, green and blue – in different proportions. Maxwell also deduced the reason for this – he realised that the human eye must comprise three separate types of light receptors, with different sensitivities across the visible spectrum, and that it is through the differential response of these different receptors to incident light that the brain constructs the sensation of colour. Colour, then, is not an intrinsic property of light itself, it is something that emerges from our human perception of light. In the last few years, my group has been exploring the relationship between biology and colour from the other end, as it were. In our work on structural colour, we’ve been studying the microscopic structures that in beetle scales and bird feathers produce striking colours without pigments, through complex interference effects. We’re particularly interested in the non-iridescent colour effects that are produced by some structures that combine order and randomness in rather a striking way; our hope is to be able to understand the mechanism by which these structures form and then reproduce them in synthetic systems. What we’ve come to realise as we speculate about the origin of these biological mechanisms is that to understand how these systems for producing biological coloration have evolved, we need to understand something about how different animals perceive colour, which is likely to be quite alien to our perceptions. Birds, for example, have not three different types of colour receptors, as humans do, but four. This means not just that birds can detect light outside human range of perception, but that the richness of their colour perception has an extra dimension. Meanwhile, we’ve enjoyed having Paul Evans as an artist-in-residence in my group, working with my colleagues Dr Andy Parnell and Stephanie Burg on some of our x-ray scattering experiments. In addition to the poetry and colour project, Paul has put together an exhibition for Festival of the Mind, which can be seen in Sheffield’s Millennium Gallery for a week from 17th September. Paul, Andy and I will also be doing a talk about colour in art, physics and biology on September 20th, at 5 pm in the Spiegeltent, Barker’s Pool, Sheffield. How big should the UK manufacturing sector be? Last Friday I made a visit to HM Treasury, for a round table with the Productivity and Growth Team. 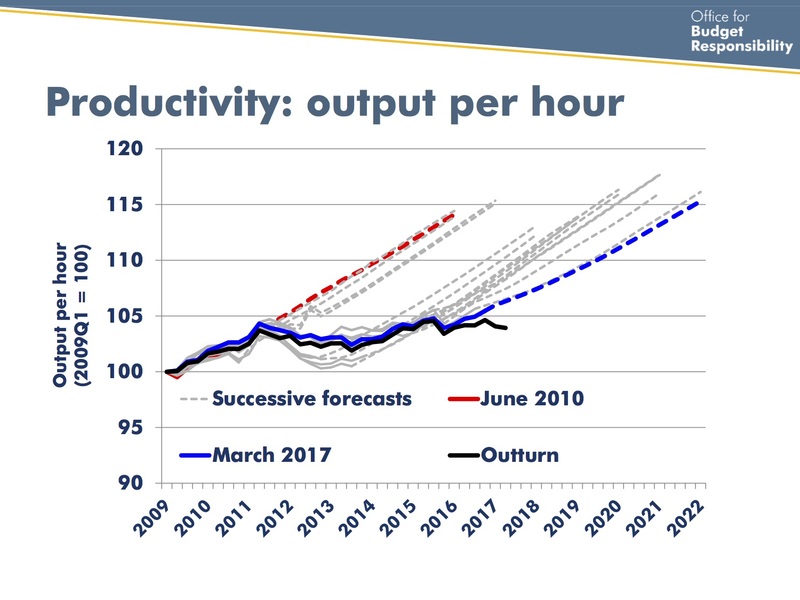 My presentation (PDF of the slides here: The UK’s productivity problem – the role of innovation and R&D) covered, very quickly, the ground of my two SPERI papers, The UK’s innovation deficit and how to repair it, and Innovation, research and the UK’s productivity crisis. The plot that provoked the most thought-provoking comments was this one, from a recent post, showing the contributions of different sectors to the UK’s productivity growth over the medium term. It’s tempting, on a superficial glance at this plot, to interpret it as saying the UK’s productivity problem is a simple consequence of its manufacturing and ICT sectors having been allowed to shrink too far. I think this conclusion is actually broadly correct; I suspect that the UK economy has suffered from a case of “Dutch disease” in which more productive sectors producing tradable goods have been squeezed out by the resource boom of North Sea oil and a financial services bubble. But I recognise that this conclusion does not follow quite as straightforwardly as one might at first think from this plot alone. Multifactor productivity growth in selected UK sectors and subsectors since 1972. Data: EU KLEMS database, rebased to 1972=1. The plot shows multi-factor productivity (aka total factor productivity) for various sectors and subsectors in the UK. Increases in total factor productivity are, in effect, that part of the increase in output that’s not accounted for by extra inputs of labour and capital; this is taken by economists to represent a measure of innovation, in some very general sense. The central message is clear. In the medium run, over a 40 year period, the manufacturing sector has seen a consistent increase in total factor productivity, while in the service sectors total factor productivity increases have been at best small, and in some cases negative. The case of financial services, which form such a dominant part of the UK economy, is particularly interesting. Although the immediate years leading up to the financial crisis (2001-2008) showed a strong improvement in total factor productivity, which has since fallen back somewhat, over the whole period, since 1972, there has been no net growth in total factor productivity in financial services at all. We can’t, however, simply conclude from these numbers that manufacturing has been the only driver of overall total factor productivity growth in the UK economy. Firstly, these broad sector classifications conceal a distribution of differently performing sub-sectors. Over this period the two leading sub-sectors are chemicals and telecommunications (the latter a sub-sector of information and communication). Secondly, there have been significant shifts in the composition of the economy over this period, with the manufacturing sector shrinking in favour of services. My plot only shows rates of productivity growth, and not absolute levels; the overall productivity of the economy could improve if there is a shift from manufacturing to higher value services, even if productivity in those sectors subsequently grows less fast. Thus a shift from manufacturing to financial services could lead to an initial rise in overall productivity followed eventually by slower growth. Moreover, within each sector and subsector there’s a wide dispersion of productivity performances, not just at sub-sector level, but at the level of individual firms. One interpretation of the rise in manufacturing productivity in the early 1980’s is that this reflects the disappearance of many lower performing firms during that period’s rapid de-industrialisation. On the other hand, a recent OECD report (The Future of Productivity, PDF) highlights what seems to be a global phenomenon since the financial crisis, in which a growing gap has opened up between the highest performing firms, in which productivity has continued to grow, and a long tail of less well performing firms whose productivity has stagnated. I don’t think there’s any reason to believe that the UK manufacturing sector, though small, is particularly innovative or high performing as a whole. Some relatively old data from Hughes and Mina (PDF) shows that the overall R&D intensity of the UK’s manufacturing sector – expressed as ratio of manufacturing R&D to manufacturing gross value added – was lower than competitor nations and moving in the wrong direction. This isn’t to say, of course, that there aren’t outstandingly innovative UK manufacturing operations. There clearly are; the issue is whether there are enough of them relative to the overall scale of the UK economy and whether their innovations and practises are diffusing fast enough to the long tail of manufacturing operations that are further from the technological frontier.